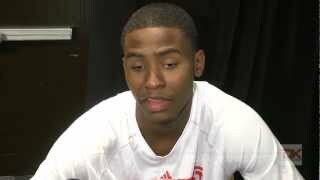 Mike Schmitz takes a look at the strengths and weaknesses of Moe Harkless with the help of St. John's game film and commentary from Harkless himself. A long and athletic small forward with a raw skill set, Maurice Harkless (#43 Scout, #45 Rivals, #42 ESPN) is a player who does most of his damage off hustle and grit at this stage, though has good long-term potential if he can further develop his skills. Harkless doesn't have much bulk on his frame now, though it looks like he could pack on another 10 pounds or so comfortably down the road. Offensively, Harkless doesn't consistently show much besides finishing on cuts, alley oops, and getting out in transition, where he shows the ability to finish capably with both power and finesse, possibly relying on the latter more often than he should. He shows good body control and coordination on his finishes, being able to put in floaters and reverse lay-ups when the situation calls for it, while also showing a pretty good activity level in seizing opportunities. In terms of shot creation with the ball, Harkless shows a somewhat comfortable handle, though he seems to lack confidence and doesn't really show the ability to take advantage of his athleticism with the ball just yet. He occasionally will pull off an aggressive move going to the hole when in isolation, but struggles when not in space. Harkless didn't have much success with his perimeter jumper here, hitting on just 1-of-6 from three-point range, though his spot-up shot has solid form and he likewise looks good at the free-throw line. His pull-up jumper, on the other hand, is prone to errant misses, and he doesn't appear to have the control to be a consistent threat there at this stage. Defensively, like most of the rest of the Red Storm recruiting class, Harkless brings a good activity level to the table and has excellent tools, being a major threat in the passing lanes and showing flashes of great things defending on the ball. He has a pretty good stance defending the perimeter, while also usually putting in very high effort levels, though he can lose focus at times. He also doesn't contribute on the boards nearly as much as someone with his size and athleticism could, as he pulled in just eight boards between his two games here. Looking forward, Harkless should be able to contribute right off the bat at the college level defending and finishing plays by utilizing his athleticism and length, though further polishing his skills will be critical for his long-term success at the college level and beyond. He shows decent flashes with both his ball-handling and shooting on the offensive end, but will need to develop much more consistency in both areas.